i mentioned in my post the other day that i've been cleaning things up around here, throwing things out, and setting some stuff aside for either a yard sale or ebay, that virtual yard sale. now i have never avoided the term "collector", at times i have used it myself, been quite proud of it...but holy crap! i mean...HOLY CRAP! over the course of my crazy, complicated, cartoon-like life, i have acquired so much trivial, useless, and in some cases, forgotten stuff that i find myself surprised by some of the stuff i've come across! an arnold schwarzenegger as sgt. 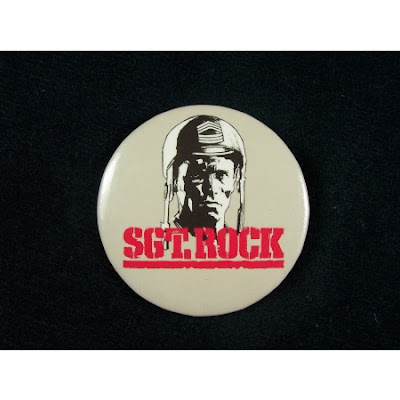 rock movie promo button from the '88 san diego convention! 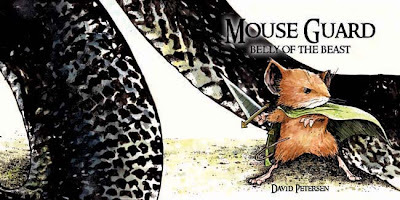 my copy of mouse guard #1 (first printing) that i put in a safe place ('cause of the off-size) that i then couldn't find for almost a year now! three bread wrappers from the 1960's featuring batman and robin and a bunch of villains--a couple that no one ever saw! a spider-man print given to me and autographed by stan and john romita that i completely forgot i had! 1. what mad artist won fame and recognition for his tiny and hilarious pantomimes in the margins of the mag? 2. (i hate that new cat-look, but) what originally made rather human-looking hank mccoy gain his more beastial visage? 3. before he became the joker, what was his wife's name? 4. who was travis walton? 5. yellowstone national park is primarily located in what state? Wow, I got almost nothing on the trivia this week. I wonder what the story was on those "new" Bat-villans. Any clues? the shark, the fox, the vulture, and mr. zero (obviously a mr. freeze prototype). i think that one or two of them were used in the daily comic strip. i'll get the camera out and post close-ups so you can get a look at 'em! I got nothing, but would love to see a picture of that Spidey poster when you get a chance. 2. Did it to himself? 1. what mad artist won fame and recognition for his tiny and hilarious pantomimes in the margins of the mag? Sergio Aragones, the World's Fastest Sketch Artist! 4. who was travis walton? John Boy's brother? You still have that Sgt. Rock button? I lost mine years ago, but I'm pretty sure I still have a couple of the Vibes postcards we picked up that year. 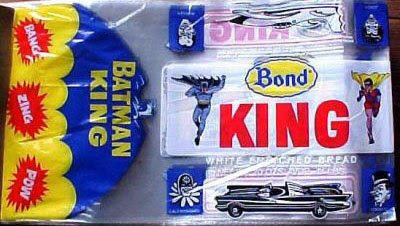 And I just came across the Batman bread wrapper you gave me a little while ago. I love that you can always find the coolest stuff. you guys are drawing blanks on a lot of these questions. have i slid from trivia to minutiae? lemme know. colin--yeah, i DID happen to be flippin' past that 5th grader show the other night--haven't watched any more than that one question. is it good?--and was amazed that so few people knew the answer. thought i'd throw it out here. It scares me to think that I've been lugging those Vibes cards around for 19 years. Has it really been that long? Damn, I'm old. Todd, the 5th Grader show is interesting to watch with other people and play along so you can mock each other's lack of basic knowledge. But as a show it's pretty lame and Jeff Foxworthy takes forever to get to the next question, which is why I flipped the channel and didn't see the Yellowstone answer.